Enzo Life Sciences continues to expand its offering of ELISA products with the introduction of the FSH ELISA kit. FSH is produced by the gonadotropic cells in the anterior pituitary gland. It regulates the development, growth, pubertal maturation and reproductive processes in both women and men. FSH along with LH acts synergistically in regulating female ovulation and male spermatogenesis. The highly sensitive FSH ELISA kit allows for quantitative detection of FSH in human specimens including plasma, serum, and tissue culture media, measuring as little as <0.5 mIU/ml of FSH. This kit offers a broad detection range with measurements of 0.78-100 mIU/ml. With the ability to analyze up to 37 samples in duplicate in just 2 hours, the kit is fit for rapid, high throughput analysis. 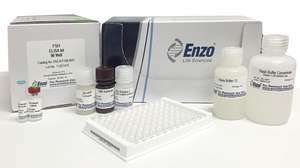 Like all Enzo Life Sciences ELISA kits, the FSH ELISA kit is complete, flexible and thoroughly validated. It is supplied with an easy-to-follow protocol, pre-coated microtiter plate and color-coded reagents to save time and reduce errors. The break-a-part strip plate design provides flexibility – not having to run all 96-wells at once. The kit is put through rigorous fit-for-purpose validation and stability testing to ensure high precision, accuracy, sensitivity, and specificity. With this new kit, Enzo Life Sciences extends its line of endocrine analysis, including angiotensin I & II, corticosterone, cortisol, DHEA, 17β estradiol, estriol, big endothelin-1, gastrin I, GLP-1, leptin, LH, oxytocin, progesterone, serotonin, substance P, testosterone, Arg8 vasopressin and 25(OH) vitamin D.
For more information, or to order the FSH or other Enzo Life Sciences products, please visit us at www.enzolifesciences.com or call us at 1-800-942-0430.